Day 6: A book that makes you sad. 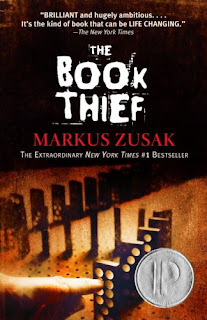 The Book Thief by Markus Zusak makes me feel more emotions than just sad but this book made me cry multiple times, in many different places through out the book. I was in awe of Marukus Zusak's ability to keep me so involved and invested in the story of Liesel Meminger. If you haven't read The Book Thief yet then it is a must! I cannot give you enough reasons to read this book. It is eye-opening, inspiring, captivating, heart-warming, sad, and wonderful! What book makes you sad? If you have read The Book Thief, what did you think of it? I feel the same way (although I haven't re-read it) but it is in my top five favorite books of all time. Thanks for commenting!! This was an amazing book...I didn't even realize just how invested I was until I was bawling my eyes out!